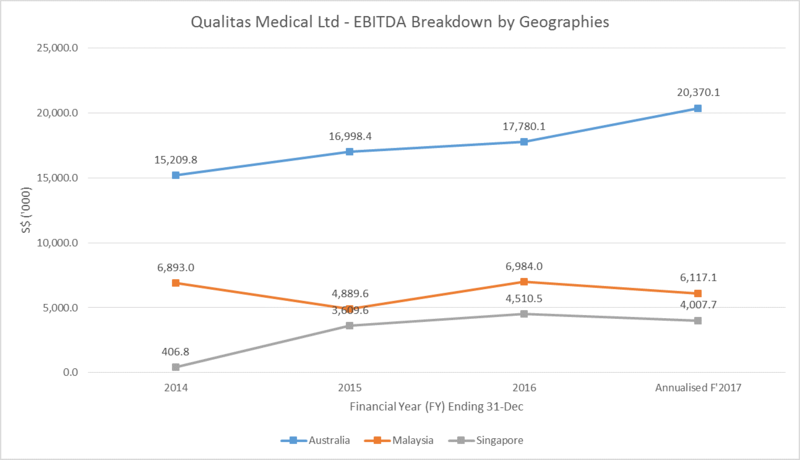 Malaysia's healthcare service provider Qualitas Medical Ltd (Qualitas) has begun marketing efforts for what is believed to be a S$100m IPO in Singapore. By picking Singapore as its listing venue, Qualitas seems to be sending investors a message that it has ambitions to expand across the region. Qualitas’ largest shareholder is Southern Capital Group (Southern Capital) controlling more than 77.7% of the shares in the pre-IPOed entity. Based on various sources from the internet, ProButterfly understands that the deal size is for 175.4mil shares of the enlarged shares base at a price range of 57c to 76c per share. This would place its total raised to anywhere in the range of $100.0mil to $133.3mil. Southern Capital does not intend to sell any of its shares in Qualitas, however, post-IPO, its stake in the entity is expected to be diluted down to the range of between 55% to 60%. There is an estimated 565.8mil shares post-invitation. ProButterfly understands that the institutional portion of the placement tranche is 166.7m shares. This leaves the retail investors with only 8.7mil shares; or less than 5%. With 8.7mil shares for retail at 76c per piece, the retail portion is only $6.6mil and we think that this will be easily snapped up with a high oversubscription multiple. Interestingly, there are no cornerstone investors in this deal. Our first impressions of the deal is that the price range offered is extremely wide; perhaps Qualitas may be keeping its options open to raise more at a higher price if the demand is good. Southern Capital being the majority shareholder post-IPO still remains the controlling shareholder with plenty of “skin-in-the-game”. This gives us comfort that they are NOT trying to exit the market by dumping poor quality assets to the public. The noticeable absents of cornerstone investors, the large placement allocation and wide price range appears to show Qualitas’ confidence in raising the funds. The breakdown of each of the purposes states was not provided in the preliminary prospectus. The final pricing of the shares are expected to be announced on 11-Apr after Qualitas roadshows in Singapore, Hong Kong and Malaysia. Qualitas expects to listing on 19-Apr. *Note: Figures used are compiled from external sources on the internet. The Preliminary Prospectus does not state the exact figures. Final confirmation would be required again when the final Prospectus is released. Based on these details, the structure seems remarkably similar to the Jumbo and No Signboard IPO last year where placements where snapped up leaving very little to the public. Along with the hype and a well-known F&B brand, the public offer was oversubscribed many times over. Would Qualitas be a repeat of this especially when investors attracted to the non-discretionary nature of healthcare assets? Therefore it is completely possible that the Qualitas IPO will result in a high retail oversubscription due to the small public offer. From here, a short term rally may ensue as those who were not allocated will buy the stock from the open market. Yet, this would not be Qualitas’ first attempt at listing. Previously, it attempted to launch its float in Kuala Lumpur in March 2015 attempting to raise $150mil, but ultimately decided to delay its listing. Internet sources seem to imply that the delay was likely due to unfavourable market conditions and tepid response from investors. This time, Qualitas’ lowered its expectations by attempting to raise only $100mil. Qualitas was earlier listed on Singapore’s Catalist exchange for 3 years before being delisting in 2011. 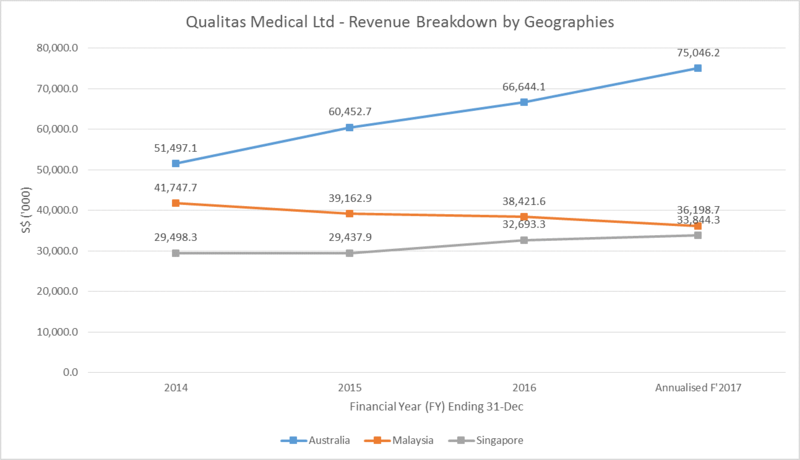 Paraphrasing from Qualitas’ preliminary prospectus, the group began its business in 1997 and is a regional primary healthcare provider headquartered in Malaysia with operations in selected markets in the Asia Pacific region. Qualitas’ primary healthcare services include primary care or general practice (GP) services, episodic and chronic care, wellness screening, medical check-ups, and occupational and allied health services. The group also offers general, specialist and cosmetic dental practices in Singapore, Malaysia, Australia and India, as well as medical imaging services in Malaysia and Australia. Qualitas’ has a presence in urban and suburban markets in Malaysia, and in selected regions in Singapore, Australia and India. 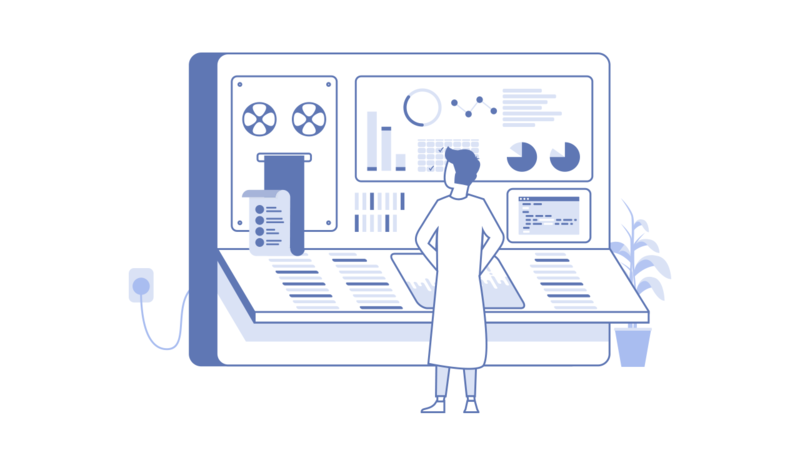 The image below taken from Qualitas’ preliminary prospectus summarizes the group’s offering across its many services and geographies. With over 240 clinics, Qualitas is considers a very large entity. As a comparison, Singapore Medical Group (SMG) has 27 clinics while Raffles Medical Group has over 100 clinics. 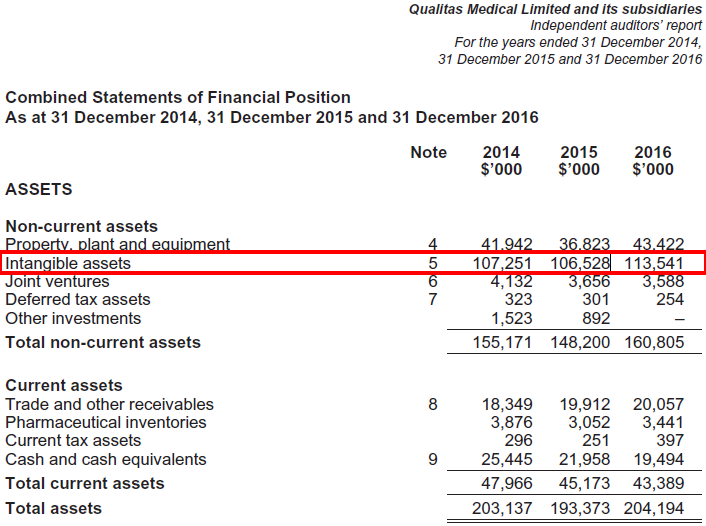 Qualitas does not have any hospitals assets. 50% of Qualitas revenue is derived from primary care through its network of clinics. Qualitas operates 136 owned primary care centres across Malaysia, Singapore, Australia and India, providing primary care services, including episodic care, chronic care, minor surgeries, specialist outpatient medical services, medical check-ups and screening services, occupational health services (only in Malaysia) and investigations and emergency care services. Medical imaging services are provided under the “Daya X-Ray”, “Qualitas Health & Diagnostic Centre” and “Qualitas Health” brands in Malaysia, and through the Synergy Radiology network of medical imaging centres in Australia. Medical imaging services provided include X-ray, MRI, multislice CT (eg angiography, cardiac and virtual colonoscopy), nuclear medicine, ECG, OPG, dental cone beam, mammography, BMD and ultrasound. Interventional procedures such as breast and thyroid biopsies to musculoskeletal injections and spinal (perineural, epidural and facet joint) interventions are also provided. We view these primary care and medical imaging services as non-discretionary in nature as will not be significantly impacted should there be any adverse economic conditions or times of recession. 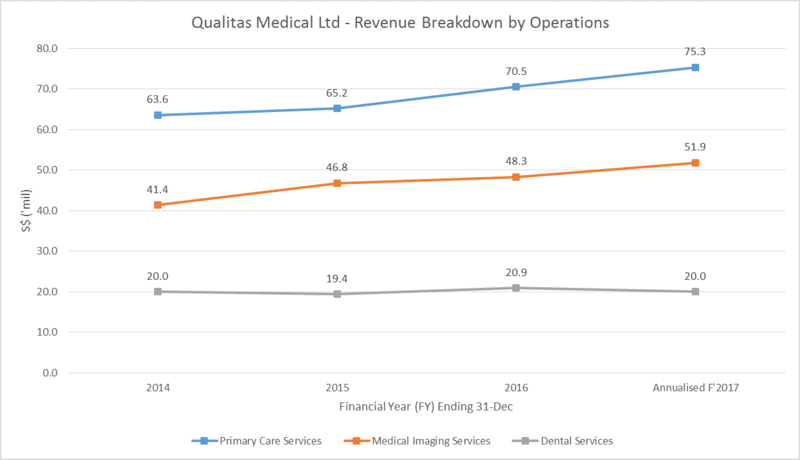 As more 85% of the revenue consist of primary care and medical imaging services which are required by the public regardless of economic cycles, we think that Qualitas would have a fairly stable and predictable revenue stream. Dental services are provided through dental clinics operating under the “Livingwell” brand in Malaysia, “Smilefocus” and “GPA” brands in Singapore and the “Dentistree” brand in India. 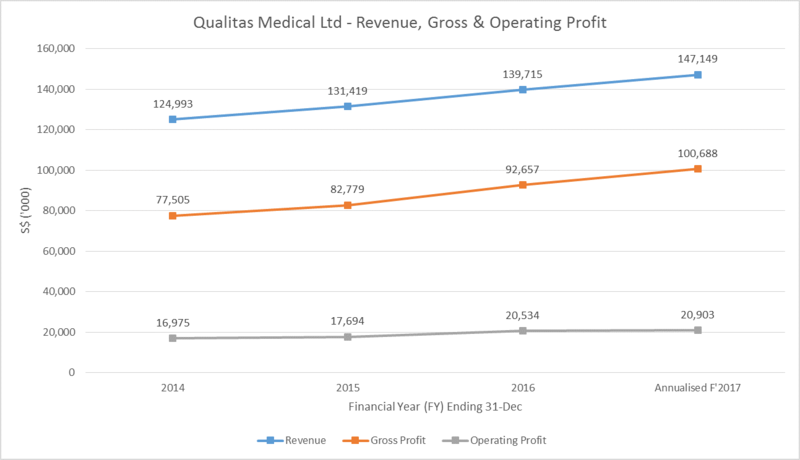 We tabulated the figures for Revenue and EBITDA growth for all 3 segments of Qualitas’ operations in the charts below. 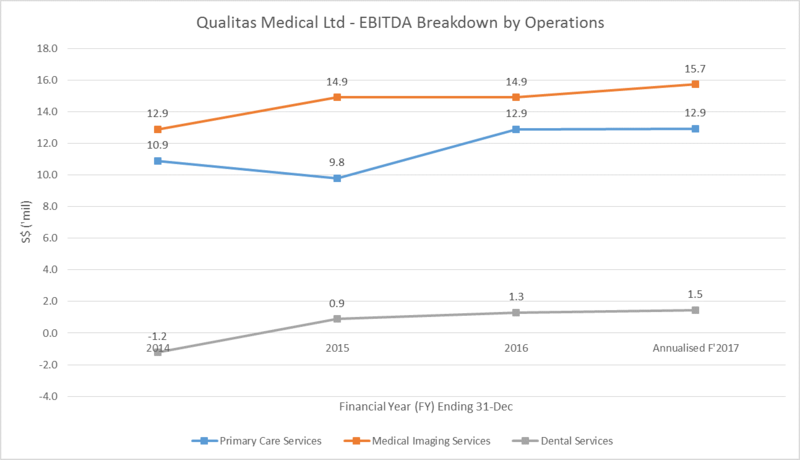 Both the core operations Primary Care and Medical Imaging services show both revenue and EBITDA growth. Primary Care services clocked a 5.8% and 5.9% compounded growth respectively for revenue and EBITDA; Medical Imaging services has shown a 7.8% and 6.8% compounded growth respectively for revenue and EBITDA. Dental services however has shown a flattish revenue growth. We are satisfied that the 2 core segments of Primary Care and Medical Imaging services are showing growth. As long as this trend continues while the dental services remain flattish, investors will still be rewarded with an appreciating share value. However if Qualitas is able to grow it Dental operations, the upside potential for investors would be higher. Malaysia is Qualitas’ largest market contributing 48% of its revenue in FY2016. We tabulated the figures for Revenue and EBITDA growth for 3 segments of Qualitas’ geographies in the charts below. India has been excluded in the plots as the figures are insignificant. Revenue growth over the years in Australia has been phenomenal. Qualitas’ Australia operations clocked double digit compounded growth on both revenue and EBITDA at 13.4% and 10.2% respectively. Singapore operations has also shown a growth in terms of revenue and EBITDA at 4.7% and 5.4% compounded respectively. 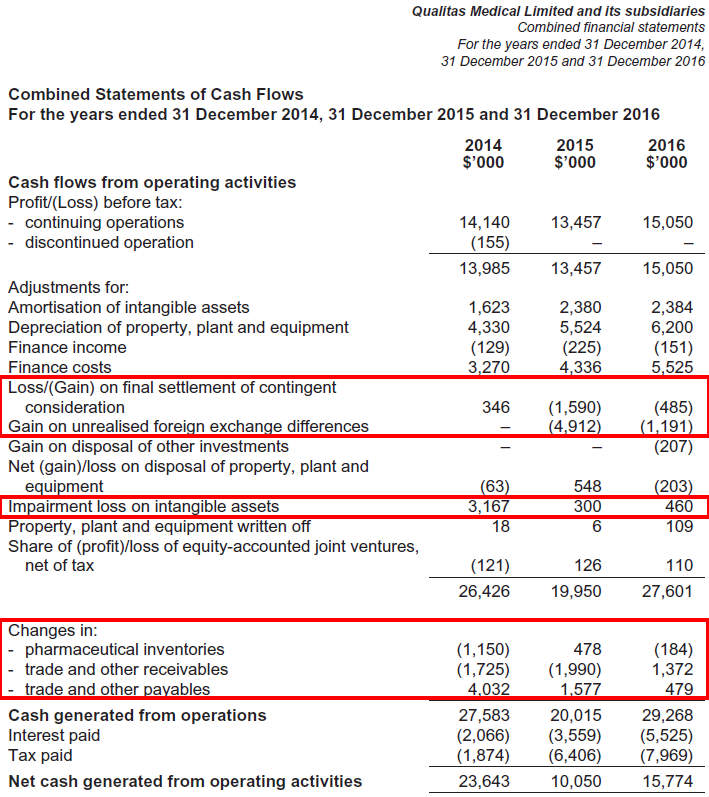 The Malaysian operations on the other hand was disappointing with a declining trend both in terms of revenue and EBITDA. The preliminary prospectus did not directly publish the figures for the revenue and EBITDA for the geographies, opting instead to publish the percentage of combined revenues. Did they to this on-purpose so that the Malaysian revenue declining trend is not so obvious? Whatever the reason, it would still be important to find out the cause of this declining trend, especially when Malaysia is the largest market making up 48% of the revenue. 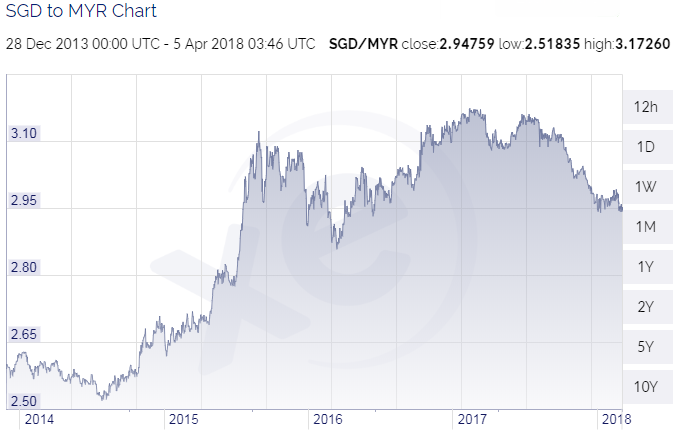 Our first thoughts of why the Malaysian operations have been showing a declining trend is probably due to the fall in the Ringgit’s value relative to the Singapore Dollar since 2014. The SGD/MYR started 2014 at 2.5926 and today trades at 2.9476. Since 2014, the exchange rate hit a high of 3.17260. This translation of reporting revenues and EBITDA will no doubt affect the reporting figures. 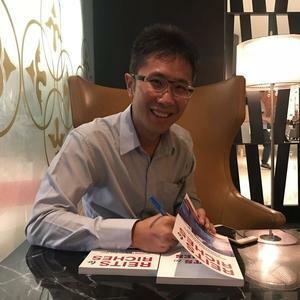 Unfortunately, we were not able to locate the reason for the declining trend in Malaysia within the preliminary prospectus, and therefore, we would have to test our theory that the exchange rate is the most significant cause of the decline. We converted the annual figures of the revenue and profits using the 01-Jul exchange rate of the respective year. Below is the charted figures we obtained. When the figures were converted to Ringgit, we found that the performance of the Malaysia Operations fairly flattish with a compounded growth of only 1.9% and 2.7% for revenue and EBITDA. This is a significant different compared to its Australia and Singapore market growth rates. This indicates to us that the Malaysian market is fairly mature and growth from the Malaysia would not likely be exciting in the coming years. 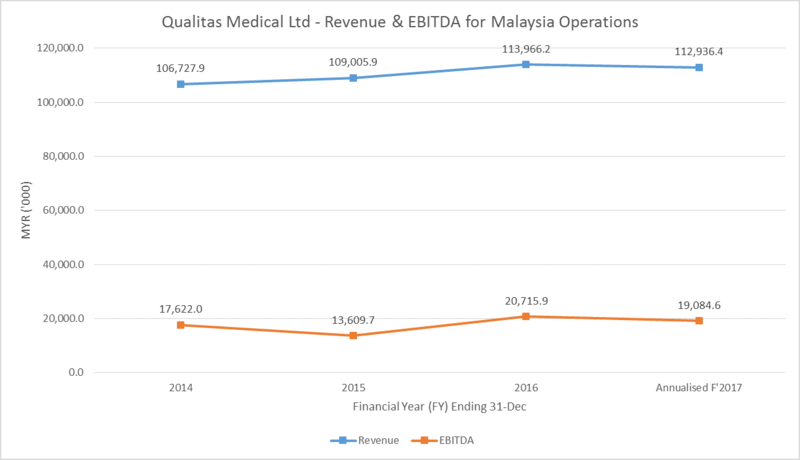 However, should the Malaysian Ringgit gain strength against the Singapore dollar as the reporting currency, the reported revenue or EBITDA could increase significantly as the Malaysia operations is a significant contributor to Qualitas’ top line. To be completely sure that there is no other factor involved, we further broke down the Malaysian operations by the 3 major segments and converted the figures into Ringgit. We found that for the primary care services operations, revenue and EBITDA growth was a flattish 1.6% and 1.7%. 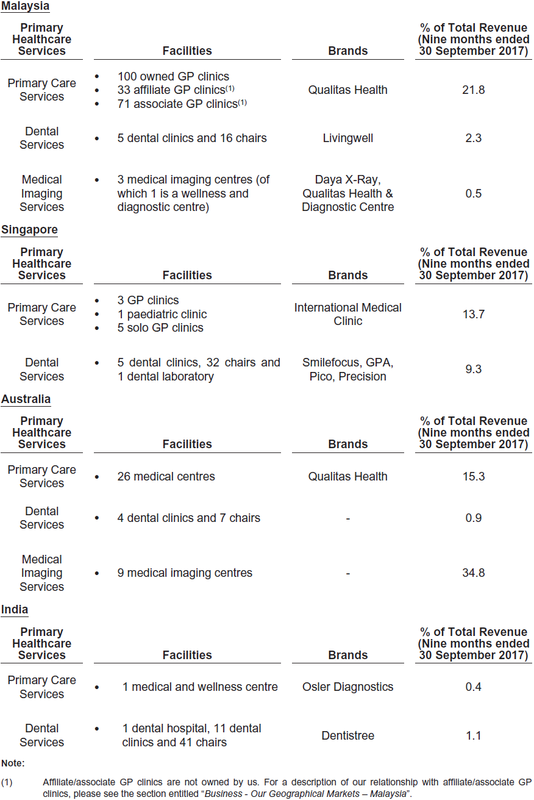 Dental services operations on the other hand was an 8.3% and 9.9% compounded growth for revenue and EBITDA. 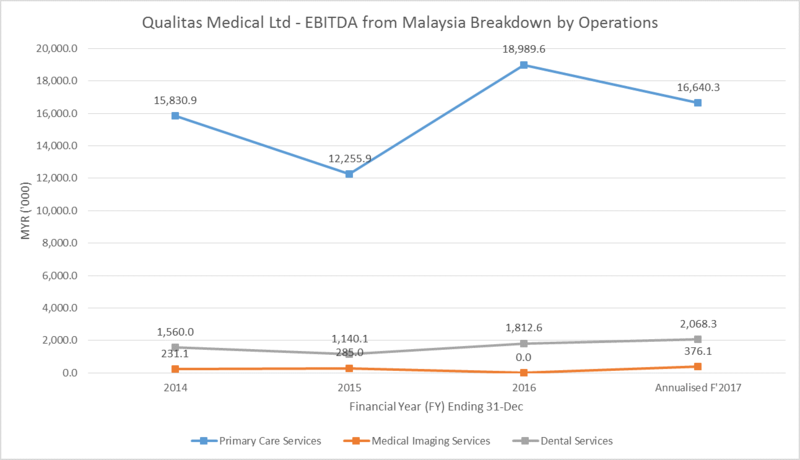 The medical imaging services operations had a very flattish revenue growth, however its EBITDA growth was 17.6% in Ringgit terms! 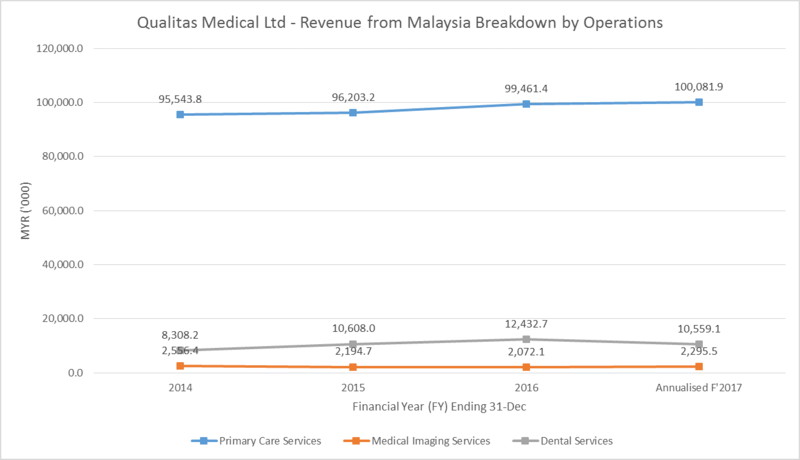 Therefore, while the primary care services was flat, growth in Malaysia generally would come from the dental and medical imaging services operations in Ringgit terms. Upon translating to Singapore dollar as the reporting currency, it shows an overall declining trend due to fall in the Ringgit’s value versus the Singapore dollar. To conclude, we can safely say that the declining trend in the Malaysia sector is primarily due to the fall in Ringgit’s value versus the Singapore dollar. We also conclude that the Malaysian primary care services operations are fairly mature and any growth in Ringgit terms in this segment is likely going to be unexciting. 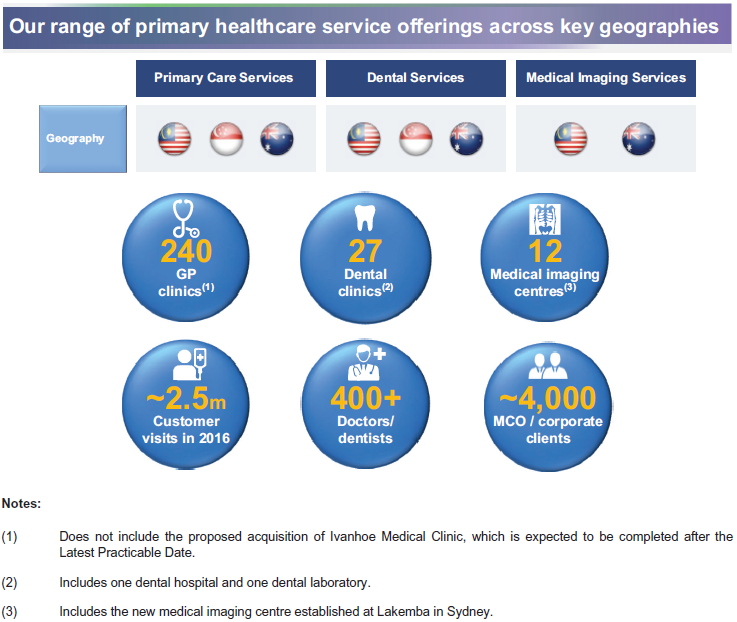 The growth from Malaysia is likely to come from dental or medical imaging services. 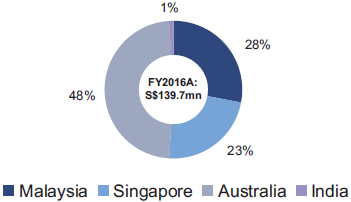 Despite the decline from Malaysia, the growth in Australia and Singapore was able to more than compensate resulting in a steady growth and the group’s revenue, gross profit and operating profit. Quantitatively speaking, the revenue, gross profit and operating profit clocked a 5.6%, 9.1% and 7.2% compounded annual growth. Qualitas is able to command a superior gross margins averaging 64.9% due to low amount of cost of goods. This is expected as it is primarily a service business rather than a business of selling goods. 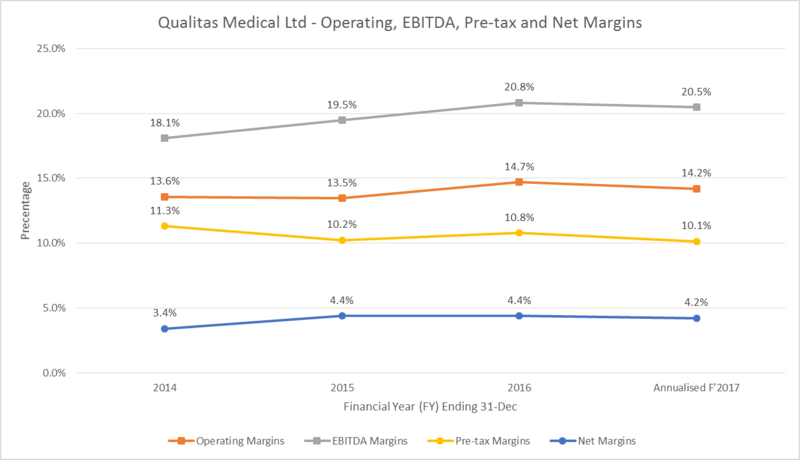 Looking onwards to its operating, EBITDA, pre-tax margins, Qualitas has also shown growth in these 2 areas averaging a healthy 14.0%, 19.7% and 10.6% over the last 4 years. However, the net margins are significantly lower with only 4.2% for the annualized figure of FY2017. One key reason for the low net margins are due to the high percentage of non-controlling interesting. Observing the Equity section of the balance sheet, we can see that in 2017, more than 29% of the equity is made up on non-controlling interest in subsidiaries. As 29% of the equity is a significant percentage, we would need to tread conservatively when analysis the financial statements as we cannot be completely be sure how much of the assets and debt will be attributed to non-controlling interesting. Looking at the operating profit, EBITDA, pre-tax and net profit trends, we can see that there is uptrend. However when plotting against the operating cash flow, we find the trend a little lumpy. This goes against what we would expect of a mature healthcare service provider. As a result of the lumpy cash flow and unpredictable CAPEX, the free cash flow trend is also lumpy. We found this rather surprising coming from a mature healthcare service provider. This indicates to us that foreign exchange risk is a significant risk factor for Qualitas especially with significant assets and revenue stream in Malaysia and Australia. It also brings our attention to the risk of impairments on its intangible asset on its balance sheet which could hurt its profitability. We will address this matter in the next section. We noticed a significant amount of intangible assets on its balance sheet. Inspecting Note 5 as a reference, we found that a significant portion of the intangible assets are made up of goodwill. This implies that the management has been actively acquiring healthcare assets over the years and these assets are acquired based on a certain future prediction of profits and cash flow. 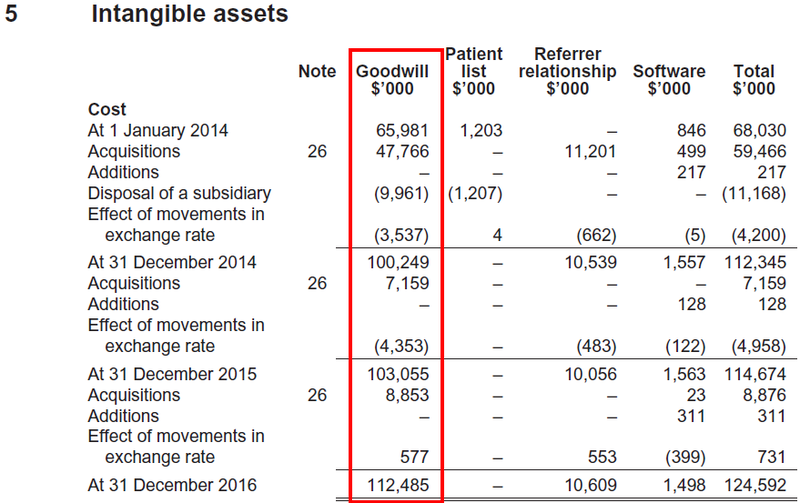 Much of these future income was priced into the asset purchase price as goodwill. In FY2016, about 55.6% of the asset value comprises of intangible assets. As at 30-Sep-2017, the 55.1% of the asset value comprises of intangible asset. This is a significant amount which concerns us. Should any of the assets not perform up to the expected income and cash flow paid for it, they may need to be impaired which affects the profitability of the group as well as increase it its debt and gearing ratios. In addition to the above, should there be a need for Qualitas to raise funds via loans or borrowings, these intangible assets cannot be used to back to loans which could result in slower growth or perhaps higher interest rates. This brings amount significant risk to investors. Qualitas has a very high debt-to-equity ratio of over 200%. This is mainly due to significant amount of non-controlling interest in the equity components. As we are not able to attribute the debts proportionally, we will assume the worse case where all the debts are attributed to the group with insignificant debts attributed to the non-controlling interest. Gearing (calculated using “Total Liabilities-to-Asset” ratio) and Debt-to-Asset ratio is a significant 71.2% and 42.8%. Keeping in mind that more than 55% of the assets are intangible assets with a significant portion as good will, this ratio is incredibly high! Adjusting our calculations to take into account the high intangible assets amount, the Debt-to-Tangible Asset ratio for quarter ending 30-Sep-2017 is an incredible 95.4%! Not surprisingly, with its high debt load, significant amount of its cost goes into paying interest. Using an EBITDA to Interest Coverage Ratio, we found that the coverage has fallen from 7.33x in FY2014 to a 4.92x in quarter ending 30-Sep-2017. In the present situation of what we expect to be a rising interest rate environment, we think that this entails significant risk to investors. Strictly speaking, IHH Healthcare and Raffles Medical Group are not peers because they hold with them significant amount of hospital assets which Qualitas does not have. Likewise Q&M Dental is a purely dental services provider while Singapore O&G is a pure play on female healthcare; on the other hand Qualitas has operations in primary care, dental and medical imaging. Singapore Medical Group (SMG) would therefore be its closest peer. Even then, the number of clinics that SMG operates is very much smaller compared to Qualitas. Looking at the earnings multiples for Qualitas, it ranges from 52x to 69x depending on the price that it will be offered at. This is significantly higher than even IHH Healthcare which presently trades at a multiple of 51x. 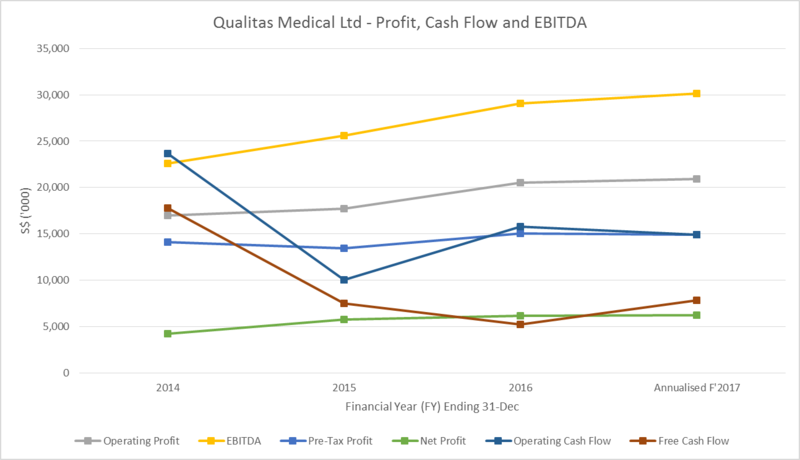 Based on EBITDA multiples however, Qualitas is among the lower priced healthcare asset among those that we have compared. The extreme distinction is likely due to the high non-controlling interest present in Qualitas. Hence we would prefer to lend more weight to the EBITDA multiple instead of the earnings multiple. Even if it is priced at the highest range of 76c, its EBITDA multiple is only 14.3x, which is the lowest of all the peers that we have compared. From a debt perspective, Qualitas has the highest debt ratios which implies a higher risk relative to other peers. We found that to understand the business of Qualitas is fairly straightforward. Major shareholder continues to hold controlling stake and hence have "skin-in-the-game"
With a tiny amount of retail allocation, we do not discount the possibility that the stock may perform well immediately post-listing due to retail investors bidding up the stock price after failing to get an allocation during the offer period. However, after looking at the various pros and cons of this IPO, ProButterfly has decided not to subscribe. We will however follow the developments of this counter and will update our readers if there are material updates worthy of mention.